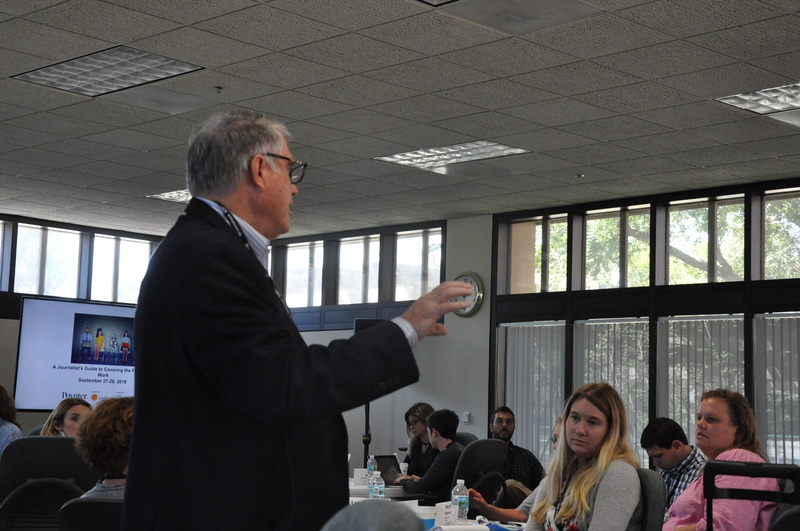 At the Poynter and WorkingNation workshop on the future of work, journalists learned about the many forms storytelling can take when reporting about jobs and the economy. 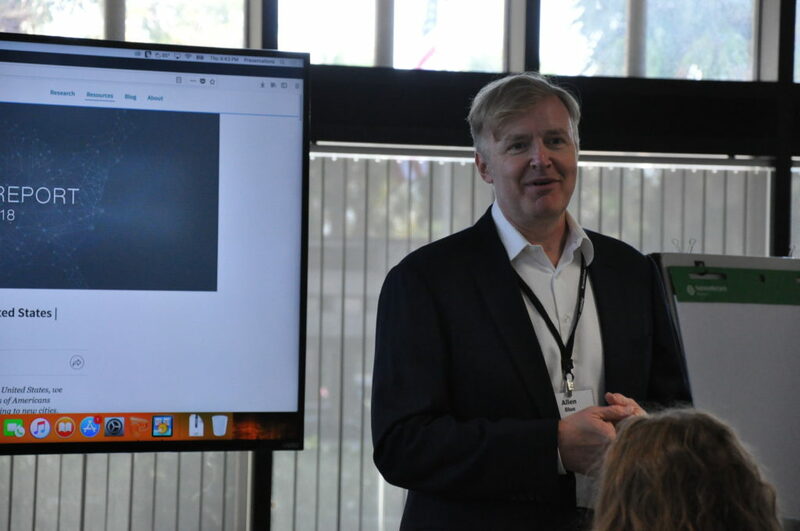 When it comes to reporting about the future of work, the guiding principle set out at the top of the Poynter Institute and WorkingNation workshop informed the rest of the discussion. 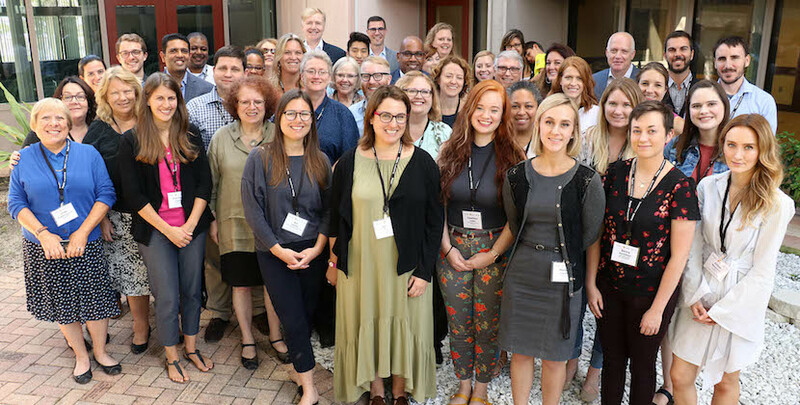 “Every story is a jobs story,” said WorkingNation’s Theresa Collington to the gathering of 28 journalists for the in-person training event at The Poynter Institute in St. Petersburg, Fla., on Sept. 27 and 28. 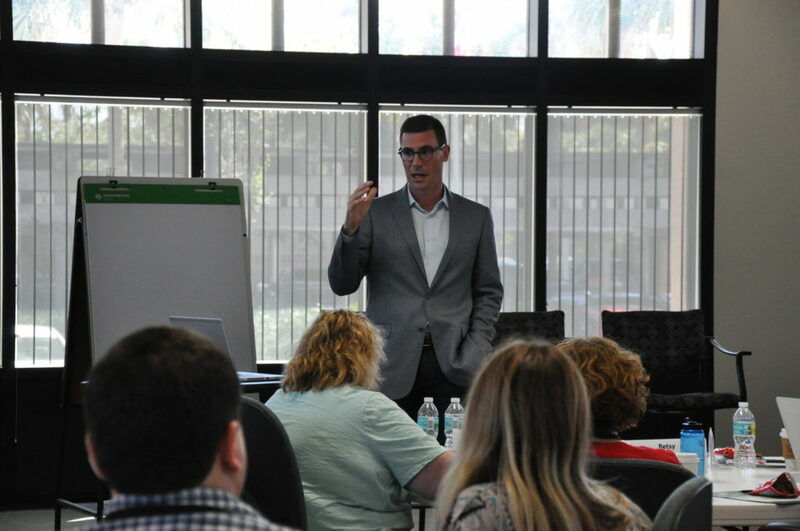 From that simple starting point, the instructors at the “Journalist’s Guide to Covering the Future of Work” delved into the many ways reporters can find unique storytelling opportunities within the world of work. Whether it was documenting the personal stories of those affected by unemployment, charting the trends that will define jobs in the next decade or utilizing data to analyze the effectiveness of workforce development programs, the ideas that will spring from the two-day seminar have the potential to amplify solutions and effect real change in American communities. 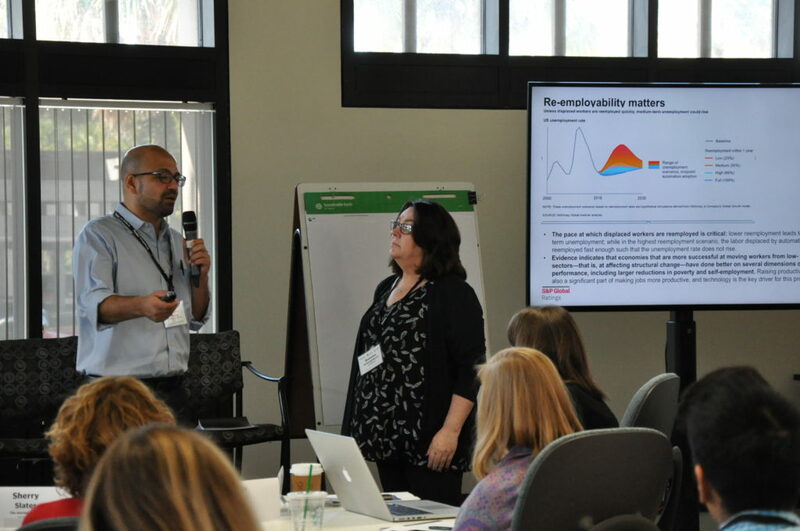 Satyam Panday started the first day of the workshop with a macro view of the current U.S. economy and where it will lead workers in the near future. Automation and the digitalization have “fundamentally changed” the economy, the senior economist for S&P Global Ratings Services said. The digital economy has grown to 10 percent of the overall share, outpacing the retail and construction sectors. Though many Americans are working, Panday urged reporters to consider the fate of low-skilled workers if another recession occurs. Those who navigated to the digital economy will be the last to lose their job, while automation will displace vulnerable workers. The remedy for this problem lies in public spending on labor market adjustment, but as Panday noted, the U.S. spends a fraction of the budget in assisting displaced workers. More investment in reskilling and retraining workers will be essential to re-employability and assisting them to move to higher-skilled work. Capturing the emotion of job loss is essential to reporting about structural unemployment on the workforce and the devastation it can bring to a community. 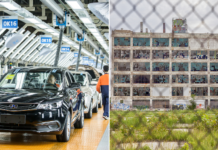 Pulitzer Prize-winning reporter Amy Goldstein shared how she came to document the displaced General Motors workers of Janesville, Wisconsin for her landmark book Janesville: An American Story. 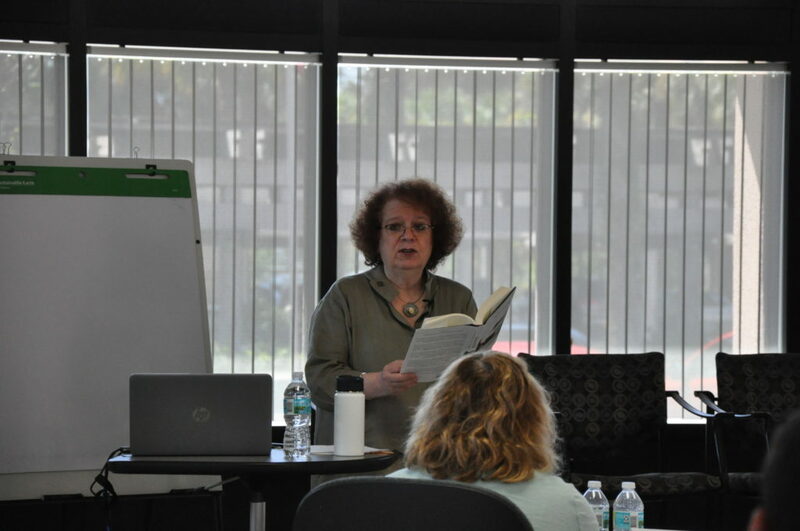 Goldstein said that she wanted her book to “feel like a kaleidoscope” which brought readers into the lives of Americans who suddenly were knocked out of the middle class. She said she combined her meticulous research of the region’s workforce data with the personal narratives of the people to show how their lives were transformed during the unemployment crisis. Some were successful in finding new work by upgrading their skills at the local community college, but they were not able to recapture the wages they once earned. Hari Sreenivasan followed Goldstein with his overview of the different and engaging ways reporters can tell stories about the changing world of work. Automation, the gig economy, artificial intelligence and the skills gap are all starting points for the discussion about workforce development. The PBS NewsHour Weekend anchor said that automation, not immigration was the biggest threat to the workforce and that technology will ultimately replace routine work. Sreenivasan cited the ongoing innovation and investment in driverless technology and robotics as indicators of an impending future that will come whether workers are ready for it or not. He said that journalists should be mindful of the effects of disrupting technology on those who were left behind, like the taxi drivers of New York City when ride-hailing services undercut drivers’ investments in medallions. 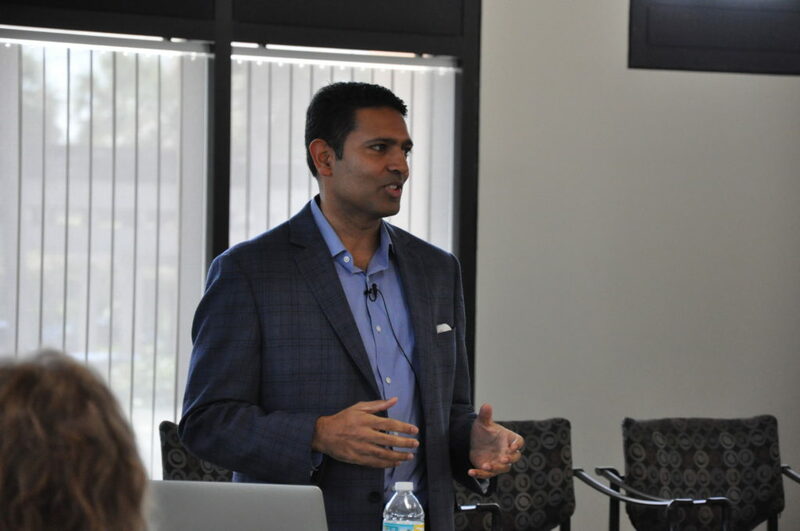 There are positive stories to be found in reporting on the future of work, according to Sreenivasan, including stories about the changes happening in education and workforce training. 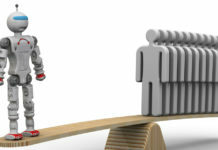 Labor shortages and the skills gap are bringing more attention to the issue of preparing workers for the jobs of the future. Sreenivasan said that reporters could play a part in changing the narrative about higher education by focusing on the “complex lives” of adult learners, the majority of whom are in America’s community colleges. One would expect that Gallup’s Senior Advisor Brandon Busteed would have statistic after statistic in his discussion about finding the jobs story in data and they would be right. 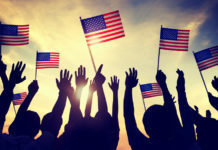 Between launching data points, Busteed said that journalists should go beyond the headline-grabbing stats about the low unemployment rate and GDP for the real story about the health of the American economy. Having a job is not enough to measure a person’s wellbeing. Busteed, who is taking on a new position as president of Kaplan University Partners, said that the quality of work is what matters. “A job is not about a paycheck. It’s about purpose,” Busteed said about the importance of having a well-paying job. 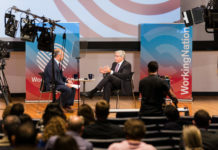 Busteed said that data gives reporters and their audiences better context about the value of higher education when factoring in cost and preparing students to enter the workforce. He noted the sharp disparity between what general public and university provosts thought about the workforce readiness of college graduates. Only 11 percent of surveyed adults believed graduates exited college with adequate skills, while 90 percent of provosts said grads were well-prepared. This disparity informs the changing attitudes toward traditional and non-traditional education pathways. Helping young people navigate the changing workforce will require reporting about all of the stakeholders involved in workforce development, according to Blue. 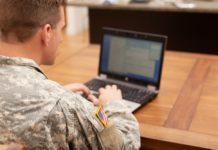 He said that LinkedIn is using data to inform the key players involved in creating the workforce pipeline about closing skills gaps and labor shortages. In turn, journalists can utilize this data to examine trends in relation to their local communities and to hold policymakers accountable for their decisions about workforce development. Reporting about non-traditional training pathways like coding bootcamps and apprenticeships will better inform the public about their choices in higher education. “There’s a lot of room for innovation in this space,” said Blue. But he said that reporters should look for solutions that are already working, whether they are in a different region of the U.S. or on the other side of the world. What works for other societies could work when adapted to a local community. It serves as a reminder that the country is not alone in its concern about the future of work. 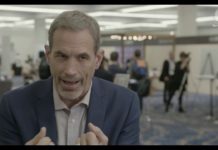 Blue said that “we need to make a cultural change” to adapt to automation, AI and digitization before time runs out “Things will change far more radically now,” Blue said. The conversation about jobs continued in the second half of the workshop with two training sessions which went into the mechanisms that support workforce development and a crash-course on the dizzying world of credentials. WorkingNation President Jane Oates sat on the panel for the discussion on the present and potential future of the American workforce. She was joined by two of the nation’s leading advocates for workforce development, JFF CEO Maria Flynn and Chicago Cook Workforce Partnerships CEO Karin Norington-Reaves. Jane Oates, Maria Flynn and Karin Norington-Reaves. Photo – WorkingNation. Together they gave an overview of the essential role workforce investment boards and job centers have in assisting workers when they lose their job. Regardless of their race, age or economic background, effective programs make the difference for many who are simply not aware of the opportunities for retraining and job placement. Norington-Reaves said that journalists should get a real sense of the unemployment situation in their communities by factoring in demographic data, which tell a different story than the national unemployment rate. Digging deeper into the data reveals populations that are at risk of long-term unemployment and can potentially be an untapped resource for employers. She said that 40 percent of Chicago’s public school graduates are out of work within one year of graduation. “They are neither connected to work or school,” Norington-Reaves said. Yet these agencies are facing an uphill climb because of the reduction of public spending on workforce development. Norington-Reaves mentioned a summer jobs program that receives millions of dollars in support but can only accommodate 30,000 Chicago youth out of 60,000 applicants. Workforce boards must come up with innovative solutions that engage both vulnerable communities and employers in search of skilled workers while maximizing the impact on their communities. They also must advocate for sustainable earnings. “The best programs set a wage target,” said Flynn. Norington-Reaves added that her organization makes a point of aligning with employers that can promise workers a living wage. 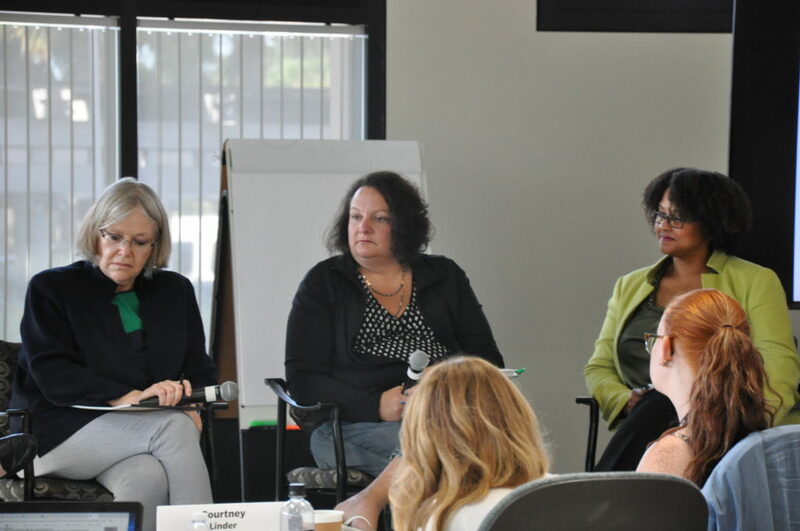 The panel also discussed the many employment barriers that make it difficult for workers to enter career pathways. “Employers want to hire a unicorn,” said Oates about the unnecessary degree and skill requirements that discourage talented workers. The panel mentioned the rise of startups like Skillist which are pushing for more competency-based training and hiring practices. While employers are moving toward skills-based hiring to fill available jobs, the most important signal they look for skills is credentials. 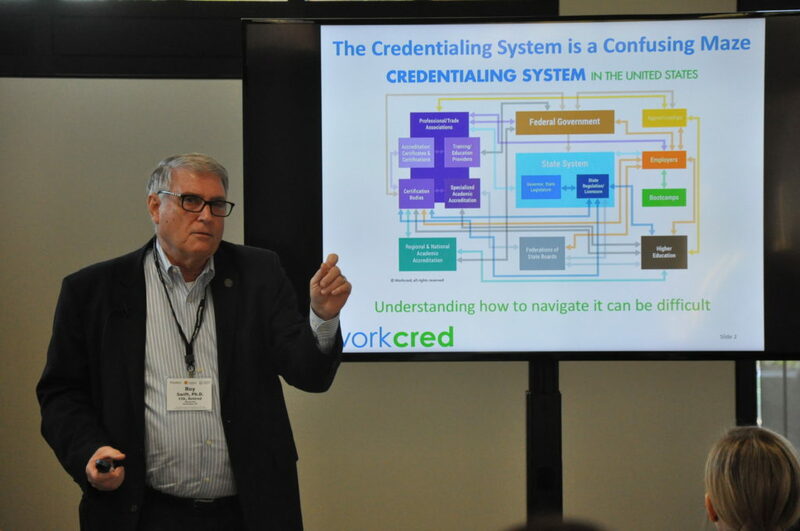 WorkCred’s Roy Swift introduced the workshop to the large and confusing world of credentials. He broke down the different types of credentials: certificates, certifications (yes, there is a difference), licenses and degrees. Roy Swift. Photo – WorkingNation. 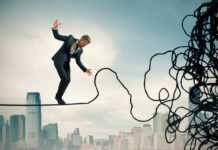 Swift said it is up to reporters to decipher the maze of governing bodies and credential issuers to better inform the public and help them avoid being taken advantage of by “fly-by-night” unaccredited organizations. The day wrapped with the visiting journalists sharing what they’ve learned from the workshop and the story ideas they will pursue in their communities. Altogether, the two-day session was an incredible burst of information that will filter out to the nation through their reporting. In turn, their stories will bring about more awareness about the workforce issues that impact all levels of our society. WorkingNation’s videos were screened during the workshop. You can watch them below. The first is our “sizzle reel” giving reporters a look at our non-profit storytelling mission. The second video comes from our Do Something Awesome video on the orthotics and prosthetics program from Century College in Minnesota. WorkingNation also premiered its latest Do Something Awesome video on day two about the coding program for inmates from The Last Mile. Thank you to Lumina Foundation for providing the funding for the free in-person training workshop. Full Disclosure: Lumina has pledged financial support for WorkingNation’s Do Something Awesome mini-documentary series.